If you haven’t yet stopped by the much-expanded location of Red Apron, right across the street from their old spot on Gladstone Ave., don’t say I didn’t warn you. You will not leave the city’s locavore-approved food emporium empty-handed. In fact, don’t be surprised if you walk out with 10 times more than you expected. It’s that kind of place — not just filled with those gourmet impulse buys like fancy jams, fresh-baked fruit pies, wonderful Quebec cheeses, granola, and handmade caramel corn, but the even more seductive stuff: an array of fresh and frozen take-home dinners. These are the proverbial home-cooked meals we all dream would appear on the table with the snap of our fingers after a long, tiring day of work. And there they are. Just take your pick. So leave it to the doyennes of “sophisticated comfort food” to combine their meal service operation with a retail shop and come up with a quick and easy “brown bag” lunch option too. Like the dinners, the lunch menu changes daily and rotates seasonally, if not more often. 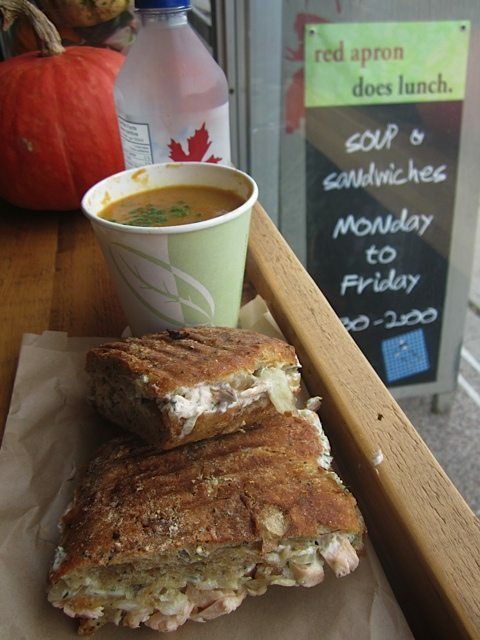 Each weekday there are two different sandwiches and one soup option. Last Wednesday, I had the choice between a grilled chicken club sandwich and the heritage salmon filet with lemon caper aioli. Both are made on the now ubiquitous Art-is-in panini buns, which attain an addictive crispy, savoury crunch when warmed on a sandwich press. I chose the fresh salmon on 12-grain fennel panini. The mild licorice flavour in the bread echoed the fresh fennel and minced fennel tops that combined with the rich aioli-moistened chunks of fish. The carrot ginger soup was sweet, thick, and velvety. I sat at one of the few stools in the shop’s window, but this is primarily meant to be take-out fare. And, let’s face it, the longer you sit there, the more likely you’ll be going home with one of those pies. Lunch hours: Monday to Friday, 11:30 a.m. – 2 p.m. You can view the weekly sandwich selection online. Red Apron, 564 Gladstone Ave., 613-695-0417.